Most expensive painting in the world? Saint James the Great, the son of Zebedee and Salome and brother to St. John the Evangelist, was one of the disciples of Jesus. He is called Saint James the Great to distinguish him from the other apostles named James (St. James the Less & James the Just). Saint James is described as one of the first disciples to join Jesus. The Gospel of John relates the two brothers had been followers of John the Baptist, who first introduced them to Jesus (1:29-39). The Synoptic Gospels state they were with their father by the seashore when Jesus called them to begin traveling (Mt.4:21-22, Mk.1:19-20). According to Mark, James and John were called Boanerges, or the “Sons of Thunder” (3:17). Acts of the Apostles 12:1-2 records that King Herod had James executed by sword (Ac.12:1-2). 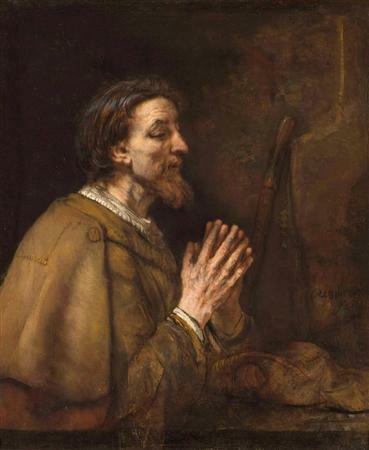 Source from Sotheby’s auction house revealed that a Rembrandt painting of an apostle in prayer could pass the record price of nearly US$29 million for a work by the Dutch painter when it is auctioned in New York on this coming 25 Jan.
“Signed and dated 1661, “Saint James the Greater” is an extraordinary work by Rembrandt van Rijn. The painting is from a group of single figure, half-length “portraits” of religious figures executed by the artist in the late 1650s and early 1660s. This emotive work, which depicts the disciple in profile, turned slightly to the right, was formerly in the renowned collection of benefactor Stephen Carlton Clark, grandson of the founder of the Singer Sewing Machine Company and brother of Sterling Clark, founder of The Clark Art Institute in Williamstown, Massachusetts. Although Sotheby’s has valued the 1661 painting, “Saint James the Greater,” at between US$18 million and US$25 million, George Wachter said there was a chance it could break the record for a Rembrandt, set in 2000. “Portrait of a Lady, Aged 62,” which was sold at auction by Christie’s in London in December 2000 for US$28.7 million, “it’s incredibly rare,” he said. This entry was posted on Monday, January 22nd, 2007 at 3:35 pm	and is filed under Interesting Stuff. You can leave a response, or trackback from your own site.